The CS-3G kits include a COM111 modem that allows data to be collected from a remote datalogger across 2G and 3G mobile phone networks. Also included are all of the necessary cables, interfaces, mounting brackets and an antenna to provide an easy to use solution out of the box. All that is needed to get the system up and running is a SIM obtained from service provider who provides good coverage at the intended site of operation¹. When configured in GPRS/3G data mode, the logger can be accessed remotely via a TCP/IP connection, e.g. from the internet. These modems are comparatively low power and are often left on all the time allowing fast access to the measurements and the fast transmission of alarms etc. On 3G networks, with good signal strength, data transfer speeds can approach that of wired serial connections. When used in GPRS/3G mode with the datalogger, alarms can be sent by email and data can be sent out from the datalogger by email, ftp or https methods². The modems can also be configured to support older GSM dial-up on 2G networks (sometimes called Circuit Switched Data mode), which gives similar functionality to a normal dial-up landline modem connection. GSM dial-up connections are charged for on a “time connected” basis so are not left on all the time. Obtaining a contract with a GSM dial-up service is also becoming more difficult to obtain as many operators no longer support it, especially for access from a landline network, therefore GPRS or 3G data services are now more commonly used. ¹When the kit is to be used in association with Campbell Scientific's Konect data collection service a SIM is available as an option as part of the subscription package. ²Not possible with the CR200X or older retired dataloggers. Connections to the datalogger can either be made from a server, normally running Campbell Scientific’s Loggernet package, or the datalogger can be programmed to call back to a server. Data can also be exchanged between dataloggers over the connection. More advanced dataloggers, such as the CR300, CR6, CR800, CR1000 and CR3000, when running in GPRS/3G mode can, in addition to normal communications, serve many of the functions normally possible over a wired IP connection which includes sending alarms and data via ftp, http or email, serving web pages and internet clock synchronisation. The datalogger can also be programmed to send SMS text messages for alarms or to send small amounts of data. More advanced dataloggers can be programmed to respond to text messages, e.g. to trigger changes in logging speed or communications methods. The COM111 modem has a low power use so in many circumstances can be left powered on. For very low power applications, it can be switched off at certain times of the day using the power switch built into some dataloggers or using an optional PSW12 solid state switch. Two different kits are available from Campbell Scientific differing mainly in the interface provided. Details are provided below. These can be reconfigured with settings which will allow GSM dial-up use. The modems and the datalogger are reconfigured with a configuration cable using a PC software tool called the Mobile Data Assistant which can be downloaded free from our website. Note: The COM111 replaces the COM110A. It has enhanced functionality. Modem serial port speed Can be set at 9600 baud For older dataloggers. It is normally set to 115 kbaud for GPRS/3G use. Data throughput rate (from the modem) Max 700 bytes per second (typically) In GSM mode. Rates can be up to 7 kB per second in 3G mode, but this is signal strength and network dependent. The transfer rates are protocol dependent. Higher speeds will be achieved with native TCP/IP protocols such as ftp and http. 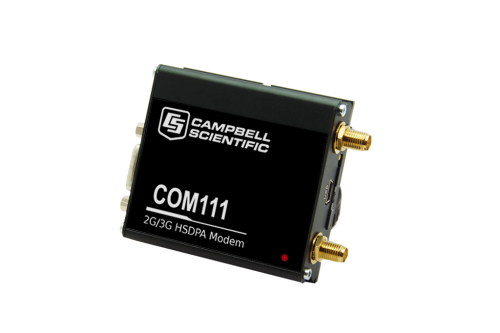 The Mobile Data Assistant is a software utility used to configure GSM, GPRS, 2G and 3G mobile communication kits sold in Europe containing the COM110, COM110A and COM111 modems. The utility provides setup and diagnostic features and can be used to view signal strength.